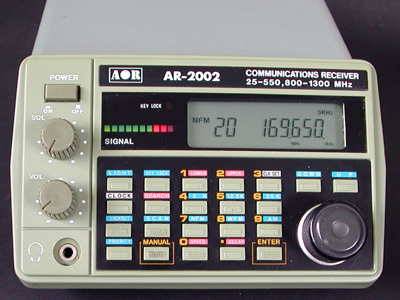 Judging from its looks, the AR-2002 is the predecessor of the AR-3000. This scanner is equipped with DIL ICs, which makes it not too difficult to add a discriminator output. 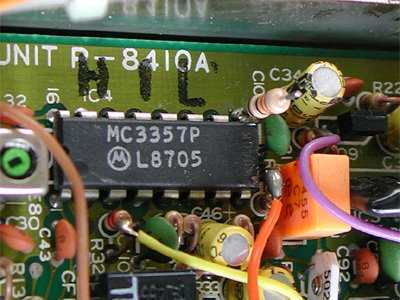 The AOR AR-2002 contains two MC3357 FM receiver ICs. One is for broadband (broadcast) FM, the other for narrowband FM. This IC, marked on the circuit board with 'IC4', is the right one. 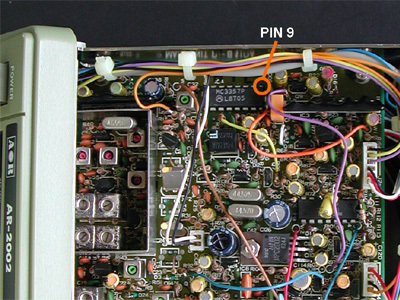 A 10 k resistor is connected to pin 9. A 3.5 mm chassis socket can be mounted in the back of the scanner. 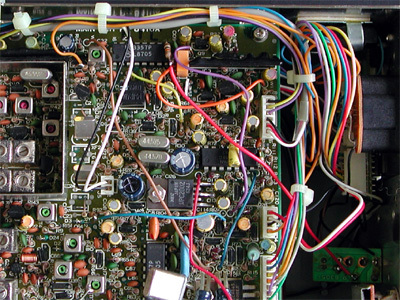 A piece of insulated wire connects the resistor and the chassis socket. A separate ground connection is not necessary, since the chassis socket is grounded through the scanner's metal frame. The owner of this scanner requested that the external speaker output socket would be reused for the discriminator output. To do this, the grey and white wire leading to this chassis terminal should be removed from the terminal and connected directly.